Total hip replacement was developed and pioneered by Professor Sir John Charnley, an English surgeon working in the north west of England in the 1950s and 1960s. 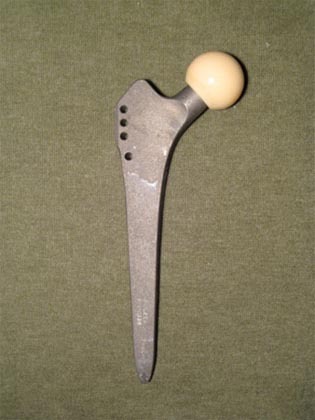 Prior to Charnley's contributions the methods used to address hip arthritis were fairly rudimentary and the functional results and pain relief were not particularly good. Charnley carried out this work at Wrightington Hospital which is now the Centre for Hip Surgery near Wigan in Lancashire. The hospital is still active in carrying out all forms of joint replacement surgery and that has now extended to other joints such as the ankle and upper limb joints including the shoulder, elbow, wrist and hand joints. The principles of total joint replacement remain very similar to those advocated by Charnley. The operation consists of exposing the hip joint, removing the femoral head or ball joint, removing any remaining articular cartilage from the socket or acetabulum and inserting a new socket with or without cement into the acetabulum. A femoral component is inserted down the shaft or internal surface of the femur. 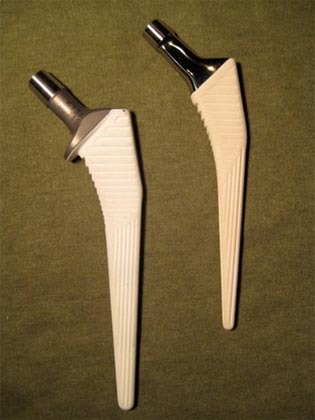 Again fixation is made by using acrylic bone cement (as advocated by Charnley) or by using a special coating which assists biological ingrowth onto the femoral shaft. 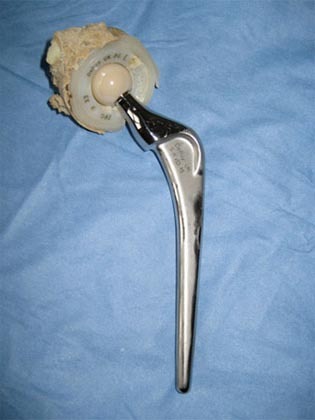 The moving(articulating) parts of the hip replacement, the ball and socket, can be made in a variety of different materials with different wear characteristics. Originally and in fact still most commonly used is a metal femoral head made out of stainless steel or cobalt chrome articulating with a socket made out of surgical grade high density polyethylene. Other common combinations are a ceramic head on a polyethylene socket, a ceramic head on a ceramic socket and a metal head on a metal socket. 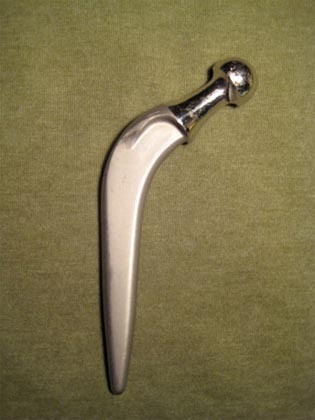 Image showing a Charnley hip stem, demonstrating the slightly rough surface of the stem and the 22.225mm metal head. 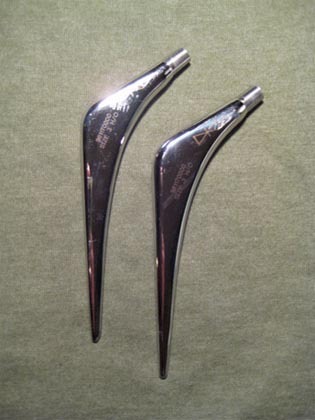 Image showing a polished, triple tapered hip stem, the C-stem. The design contrasts with the original Charnley by having a smooth, polished surface and is modular in that different head sizes can be used. 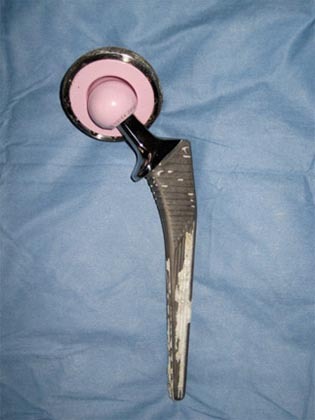 Image showing an uncemented hip stem (the Corail stem). The textured surface of this titanium stem is covered with a layer of hydroxyapatite to encourage the patients bone to grow onto the implant. Image showing an different type of uncemented stem, the Zweymuller stem. A ceramic head is shown. 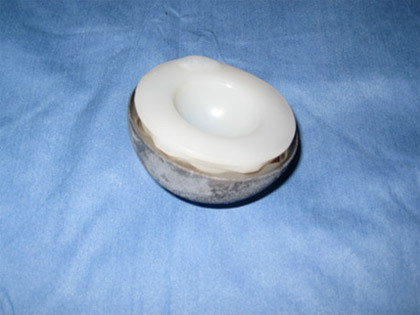 Image showing a ceramic on ceramic hip system (a Corail stem with a Pinnacle socket). 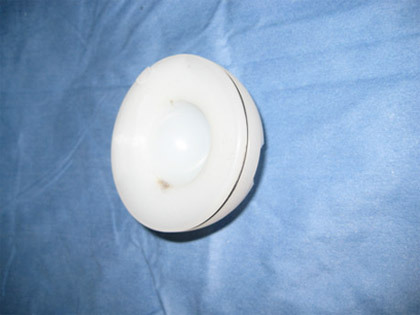 Image showing a ceramic on poly hip system (Charnley Elite Plus stem with cemented poly socket). Image showing an uncemented socket with a poly liner. Image showing a cemented poly socket.